Purex Complete Crystals Softener doesn’t build up in fabrics like oil-based softeners. 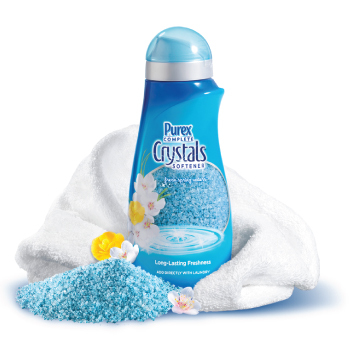 Did you try the new Purex Complete Crystals Softener yet? Recently, I was selected as a Purex Insider and sent a sample to review. Here is why this product is ahead of its competition. Unlike traditional liquid softeners, Purex Complete Crystals is added to your washing machine with your clothes before starting a load. You’ll save time instead of that extra step it took to add liquid softener to the final rinse. Gain security knowing Purex Complete Crystals Softener is 92% natural and able to infuse fabric and fibers with freshness for longer periods of time unlike the competition, which is oil-based. More important, oil-based softeners cause reduced absorbency of items like towels, yellow clothes in time, and even make children’s tested sleepwear flammable from the slick coating! Next Post Flea Market Finds: Need a Great Gadget?